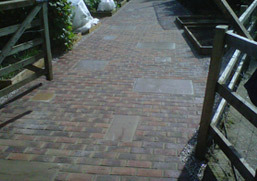 With such a wide range of colours, styles and effects of patios you will never be stuck for choice. The only most important choice is to choose the best installer. 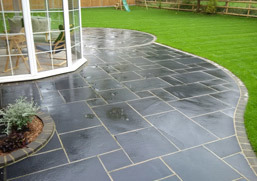 Popular stones are: sandstone, granite, slate, York stone. All very different in looks, price and style to please every customer. Most popular from installer’s point would be sandstone. 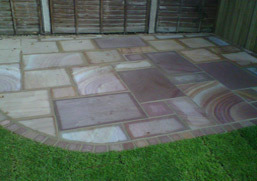 Sandstone comes in many colours: sunset buff, fossil buff, grey, autumn brown, modac, midnight black. Natural stone comes in random bond which is made up from 4 sizes: 300mm x 300mm, 300mm x 600mm, 600mm x 600mm, 600mm x 900mm. Prices of natural stone vary from £18/50 m2.